Vaxira® is a therapeutic vaccine for the treatment of non-small cell lung cancer (NSCLC). It is composed of Racotumomab and aluminum hydroxide adjuvant. Racotumomab is an anti-idiotypic monoclonal antibody which induces in the patients a potent immune response against specific glycolylated gangliosides (NeuGcGM3) present in the tumor cells. Vaxira® increases the survival of NSCLC patients in recurrent or advanced stages (IIIB/IV) compared to best supportive care. Vaxira® is well tolerated and its safety profile is acceptable. Most common adverse events are localized (at the site of administration), mild and transient. Even those patients who were immunized with Vaxira® after their disease progressed have shown improvement in overall survival. Formulation: Each vial of VAXIRA® contains: mAb Racotumomab 1.00 mg, aluminum hydroxide [Al(OH)3] 5.00 mg, tris (hydroxymethyl) aminomethane 12.14 mg, sodium chloride 3.40 mg, water for injection qs 1.0 ml. Vaxira® is an immunotherapeutic agent composed of the anti-idiotypic monoclonal antibody Racotumomab and aluminum hydroxide (AH), a widely used adjuvant. AH enhances the production of antibodies, but is neither immunogenic nor a hapten. It behaves as a depot at the site of injection from which the antigen is released slowly and, at the same time, it induces the formation of granulomas that attract immunocompetent cells such as antibody-producing plasma cells. AH may directly stimulate monocytes to produce proinflammatory cytokines that can activate T cells, and it may also stimulate the B cell response. Gangliosides are a broad family of glycolipids that contain neuraminic acid (also called sialic acid) in their structure, and are present in the outer layer of the plasma membrane. In contrast to many mammals, including apes, NeuGcGM3 gangliosides are virtually undetectable in normal human tissues and fluids. This is because human cells lack the cytidine monophosphate-N-acetylneuraminic acid hydroxylase (CMAH) due to a genetic mutation that occurred more than 2.5 million years ago. However, the NeuGcGM3 gangliosides are highly expressed in certain human cancer cells. In non-small cell lung cancer, the presence of these gangliosides has been detected in over 90% of the samples evaluated. Representation of the trisaccharide structure of a NeuGcGM3 ganglioside and its expression in tumor cells. The presence of NeuGc in human cancer cells is the result of the metabolic intake of this molecule directly from diet. Its preferential incorporation into tumor cells is most likely due to their fast metabolism. In addition, hypoxic conditions in the tumor microenvironment are thought to induce the expression of a neuraminic acid transporter in tumor cells, thus promoting the incorporation of neuraminic acid from the milieu. It has been demonstrated that, during oncogenic transformation, qualitative and quantitative changes occur in ganglioside expression levels. Their overexpression has been associated with the regulation of cell growth, immune tolerance (or immune regulation of the tumor microenvironment), metastasis and tumor angiogenesis. Taken together, these data suggest that gangliosides make an attractive target for cancer therapy. A problem that poses an interesting challenge, however, is that gangliosides, like all glycolipids, have a low potential to induce an immune response. In order to circumvent this issue, anti-idiotypic antibody technology can be utilized. Anti-idiotypic antibodies are unique in the sense they are able to act as antigens. The region of the antibody that participates in antigen recognition is called idiotype. The existence of anti-idiotype antibodies could be explained by Jerne’s Idiotypic Network theory. His theory postulates that the immune system, after producing a specific antibody against an antigen, will continue to produce antibodies against the idiotype of that first antibody. In turn, this new antibody will expose a new idiotype, thus creating a network of idiotypic interactions. Hence, the immune system would be controlled internally by a network of idiotypes and anti-idiotypes. The Idiotypic Network hypothesis would predict that, due to the diversity of variable regions in antibodies and the fact that each antibody binds to its own antigen as well as other antibodies, the foreign antigenic universe is mimicked by idiotypes within the immune network. According to this concept, immunization with a given antigen generates the production of antibodies, termed Ab1, against this antigen. These Ab1 antibodies can generate a series of anti-idiotypic antibodies, termed Ab2. These particular antibodies, whose idiotypes fit into the antigen binding site of Ab1, can generate a specific immune response against the nominal antigen. Therefore, immunization with Ab2 antibodies would trigger the generation Ab3 (anti-anti-id antibodies) that will recognize the original antigen identified by Ab1. Thus a practical outcome of the Idiotypic Network theory is that the idiotypes could be used to emulate any of the existing antigens, or as surrogate antigens. Several Ab2 of this type have been used to challenge the immune system to induce specific protective immunity against tumor antigens. Racotumomab is an anti-idiotypic antibody that mimmics glycolylated gangliosides (NeuGcGM3) in its idiotype. Thus, when administered intradermally, Racotumomab acts as a surrogate antigen and activates the immune system to generate a specific response against tumor cells expressing the NeuGcGM3 ganglioside on their surface. This study evaluated the efficacy of Vaxira® in the treatment of advanced-stage NSCLC. 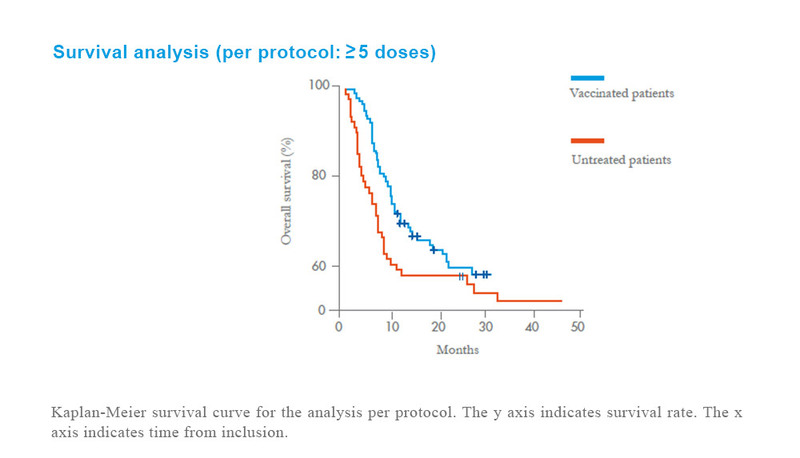 To evaluate the impact of Vaxira® treatment on overall survival. The vaccination schedule consisted of 5 doses of either Racotumomab or a placebo, administered at 14-day intervals (induction period), followed by monthly booster doses (maintenance period). After one year of treatment, the study was unblinded and only patients in the Racotumomab arm continued vaccination. Study Design: Double-blind, multicenter, randomized (1:1), placebo-controlled trial. 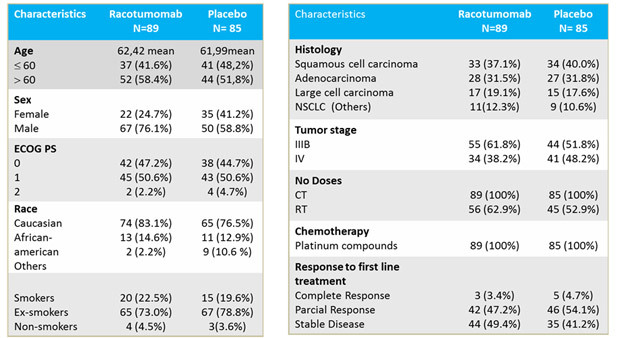 The patients included in this trial were diagnosed with NSCLC, stages IIIb and IV, and had either achieved a complete or partial response, or had their diseases stabilized after first-line cisplatin-based chemotherapy. In the intent-to-treat analysis (ITT) 174/176 patients were included. The mean OS in the Vaxira® group was 15.68 months (median 8.27 months), compared to 10.65 months (median 6.27 months) in the placebo group. The difference between the two groups was statistically significant (p = 0.02). The OS rate at 12 months for patients treated with Vaxira® was 38%, compared to 24% in patients treated with placebo. The OS rate at 24 months in the Vaxira® group was 17%, compared to 7% in the placebo group. The survival analysis per protocol (PPP) evaluated only those patients who had received at least 5 doses of either vaccine or placebo, i.e., patients who had completed the induction phase. 135/173 patients were included in this evaluation. Mean OS in the Vaxira® group was 18.9 months (median 10.9 months), compared to 11.45 months (median 6.9 months) in the placebo group. The difference between both groups was statistically significant (p = 0.002). Importantly, in the Vaxira® group the OS rate at 12 and 24 months was 48% and 22%, respectively, compared to 28% and 8% in the placebo group. This was the first clinical trial that showed, in a randomized and controlled setting, the superiority of Vaxira® vs. placebo. This analysis demonstrate that patients treated with Vaxira® who complete the induction phase live, on average, 4 more months compared to patients who receive a placebo. Furthermore, survival after disease progression was also significantly higher (p=0.0042) in patients who received Vaxira® (mean 11 months, median 4 months) compared to patients in the placebo group (mean 4 months, median 2 months). This evidence supports the hypothesis that continued vaccination after disease progression has a positive impact on patient survival. The most common adverse events reported were pain at the injection site, bone pain, cough and dyspnea. The rate of adverse events related to Vaxira® does not increase with the number of immunizations, which supports the extended use of the vaccine while the patient′s general condition allows it. The efficacy and good safety profile shown by Vaxira® in this clinical trial is very encouraging, since it would offer a new treatment alternative to NSCLC patients.